For many people, turmeric is just a yellow-coloured kitchen counter spice often added to Indian and Chinese dishes. Did you know that there are actually many health benefits of consuming it, and it is used for medicinal purposes in many cultures that opt for natural medicine? There are even many studies that show the brain and overall health benefits of adding turmeric to your meals. Used as the main curry spice, Turmeric is one of the most powerful herbs around when it comes to fighting and reversing disease. Researchers have found that it is beneficial due to the compound curcumin, and is as useful as the likes of ginger, garlic, and cinnamon. The curcumin is better than pharmaceutical medicines in many cases, which is why many practitioners focus on it so much in their herbal remedies. The active ingredient offers the anti-inflammatory effects and is also one of the strongest antioxidants in the world. The herbal remedies overseas and by specialist practitioners will usually use turmeric extracts and not just the spice in the curries. This is to make sure they get higher amounts of curcumin to benefit really from the ingredients. If you want to benefit, you’ll need to look out for extracts that contain enough for you to get around a gram a day. One of the biggest issues, especially when it comes to the low amounts of the over-the-counter spices, is that the curcumin doesn’t absorb that well into your bloodstream. You can take steps to help that to make sure you get all the benefits you need. Black pepper is one of the best natural products to add to your turmeric mix. The pepper contains piperine, which helps with the absorption of curcumin. There are a few ways that you can add this to your mixture, such as mixing the two together into a drink to have at once. You could also swallow whole peppercorns with your supplement, instead. Adding a fatty meal with your supplement will also help with the absorption levels. Think about the fat healthy meals, using the likes of olive oil or omega 3 fatty acids to give your body other health boosts. You can benefit in many ways from adding turmeric into your diet. Here’s all you need to know about the health benefits and how to get them. Inflammation in the body is extremely problematic. It is usually the reason that many illnesses and diseases feel worse, so finding something that will help will help to ease your mind. Turmeric offers the perfect remedy due to the curcumin mentioned above. It holds anti-inflammatory properties, helping to soothe swelling and pain linked to this issue. Whether you suffer from carpal tunnel syndrome or IBS, you may find that the ingredient helps. While it does all this, it does it without affecting the bacteria levels. Some inflammation in the body is needed to help stop bacteria taking over and causing other illnesses. The turmeric helps to keep the inflammation to an acceptable minimum. Sometimes inflammation may also lead to snoring which then can lead to a sleep apnea ﻿device to be required. The main benefit is that it prevents chronic inflammation, even minor inflammation that just keeps continuing without any relief. This type of inflammation is linked to various problems in Western cultures, including heart disease and Alzheimer’s disease. The curcumin actually targets the cells that cause inflammation to prevent anything happening. You don’t just treat the symptoms but stop the problems occurring in the first place. If you are suffering from inflammation at the moment, it will also target the cells to prevent it getting worse and to counter the current problems. Ibuprofen is commonly used as a medication to help reduce inflammation. While this can be successful, what are you really doing to the rest of your body? This is the problem with over the counter medication and pharmaceutical drugs. You don’t know the long-term damage, and there are few studies that go into the long term problems. At least with turmeric, you know that the product is completely natural. People have used it for centuries and not directly suffered from it. The antioxidant properties of turmeric offer the benefit of fighting against cancer. The antioxidants fight against the free radicals in the body, so when cells become damaged or die they will grow back and heal healthily. There is little room for cancerous cells to make their way into the body. The curcumin will actually stop the free radicals from even forming in the body, very much in the way it stops inflammation from having a chance to occur. This means you don’t just treat symptoms and side effects but will actually pre-empt and actively prevent it. The antioxidants are also beneficial for many other diseases, as they help to promote healing. While preventing cancer, they can help to reverse some of the effects and prevent it from getting worse. More research into this is needed, but the current research is extremely positive. There are many people currently looking for ways to protect themselves from brain disease. You will have heard that omega 3 fatty acids are the ones to focus on, but turmeric will help too. The curcumin helps to promote a healthy brain, especially when it is eaten with healthy fats to help promote absorption. Improving brain function helps to limit the cloudy feeling throughout the day. You won’t feel as tired, and mood swings will be kept to a minimum. At the same time, you keep your brain active, so you are less likely to suffer from brain diseases, like dementia and Alzheimer’s. When you improve your brain function, you promote the release of healthy chemicals into the body. You can find mental illness is improved and sometimes cured. Those who suffer from depression have found that adding the spice is beneficial for their needs. There is no need to take anti-depressants while using turmeric, although it can work in conjunction with them. The biggest benefit is that you get to avoid over the counter and prescription medication to help your overall health. There are studies that show the turmeric has helped to fight off depression cycles and can help to boost your mood. The happier you feel, the healthier you will eat too. You’ll be willing to do more, and this will have a positive cycle. The curcumin can help the brain to release more serotonin and dopamine naturally, so you don’t feel like you need to rely on the medication. How does turmeric—or more notably curcumin—do this? It is all through the focus on creating more connections between the neurons in the brain. It also promotes the growth hormone that the brain needs to develop and act as it should. In some cases, it is possible that turmeric can reverse some damage already in the brain. It can help prevent dementia and other illnesses getting worse and repair the damaged areas. This is something that more research is needed in to see just how beneficial the active ingredient in the spice is for the brain and brain diseases. This has been mentioned a couple of times, but turmeric can reduce the need for numerous types of medications. This is especially the case for ibuprofen and anti-depressants, but it can also reduce the need for pain killers and aspirin. Some people have been able to switch to turmeric and come off their diabetes medication. While doctors prescribe medications, you don’t know everything that they are doing to your body. If you read the warnings and the potential side effects of each drug you took, it would be reasonable to be worried about the long-term effects. Some medications make you feel sick, while others lead to weight gain and mood swings. There is a reason many cultures still focus on herbal remedies and have full success with them. Turmeric is one of those that can help to reduce the amount of Western medication that you take. Not only will you protect your body from the potential long term damage, but you can also protect your wallet! Getting turmeric spice and supplements are going to work out much cheaper than the majority of the medications you need to buy over the counter or through prescriptions. There are also some side effects that medications cause. They are sometimes more problematic that the actual condition you are trying to fight. Some of the side effects also lead to other health problems in the future, which doctors already know about. Turmeric doesn’t have any side effects. While the curcumin may not be better initially for treating your condition, the lack of side effects makes it much easier to deal with on a long term basis. This is very much the case when it comes to steroid use for various diseases. The steroids cause acne, weight gain, asthma, cancer, cataracts, and many other illnesses. You can avoid all of them by sticking to an herbal option. Before you switch all your medication for herbal remedies, it is important to talk to your doctor or another health professional. Find out the truth about the benefits of the medications and the herbal remedies to make sure you put your health first! Turmeric can help to keep the blood sugar down. It doesn’t cause an insulin response, and there are even studies that show it can help to reverse the effects of diabetes. This is all linked to the curcumin, again. The compound helps to prevent insulin responses on a continuous basis, so the body doesn’t get overly used to the chemical in the body. The body won’t develop a resistance to it, forcing the body to produce more on a daily basis. This is the reason people start developing type 2 diabetes. You will still need to follow a healthy diet and put your health first. The turmeric definitely can’t work miracles! Those who suffer from joint and muscular pain may be able to benefit from the use of turmeric. In many cases, the pain is due to inflammation, and this kitchen spice is perfect for countering inflammation. It also has pain relief properties, which helps people manage the pain much more effectively during the day. If you suffer from the likes of fibromyalgia or arthritis, you may want to consider using the turmeric on a more regular basis. You can just add it to your cooking to help to get the initial benefits to see if you want to take the herbal treatment further. Studies have shown that turmeric can help ease joint pain in arthritis patients, specifically. You may find that you reduce the amount of medication to help your joint and muscular pain. This can make you feel more positive about your life. Gastrointestinal problems are common in the Western world. There are many suspected reasons for this, but people don’t really want reasons. They want treatments that work, especially when they have flare-ups. You may be able to cut out foods that cause the flare-ups, but they can still happen without any warning. Turmeric can help with this. Many of the gastrointestinal problems like IBS and Crohn’s disease are due to inflammation. It’s already been mentioned that the curcumin has anti-inflammatory properties, and they will help to reduce the symptoms of numerous GI tract discomfort. In fact, you may be able to cut them down to nothing at all. By taking the turmeric, you can avoid taking corticosteroids. While these may be beneficial for reducing symptoms, they have been linked to damage to the intestinal lining. This leads to other health problems later in life. The curcumin hasn’t been linked to anything like this. Can You Suffer from Allergic Reactions? Like with any food, there is the possibility that you will suffer from an allergic reaction. This is more common if you put the turmeric direction onto your skin, rather than if you ingest it. The most commonly noted allergic reaction is an itchy rash. If this is the only problem you notice, you can take steps to avoid skin contact with the ingredient. However, there are some symptoms noted when ingesting the spice, especially in high doses. Nausea and diarrhoea are the most common problems noted with the spice. You may also be at risk of bleeding as it also acts as a blood thinner (the reason why it can replace aspirin) so you will need to keep an eye on your blood clotting abilities. Some people have also noted low blood pressure, increase blood flow during their periods and hyperactive gallbladders. If you are pregnant, you may have more uterine contractions. These are rare side effects and usually due to allergic reactions. You may also have trouble breathing, depending on the way your allergic reaction takes place. If you do notice any of them, stop using it and speak to your doctor about the best option moving forward. Unfortunately, turmeric can also react with some medications if you try to use it in conjunction with some prescription or over the counter drugs. The most common are aspirin, due to the blood thinning properties. Because of the anti-inflammatory products, it can also affect the benefits of any products like ibuprofen. In most cases, the turmeric will be a good ingredient to add with your current prescription medication, but do talk to your doctor about side effects. The main benefit is that the Turmeric will help counter many of the side effects noted with medications. It is all about acting safely. Many of the research papers looking into turmeric and health benefits have been to consider how it works instead of medication. There have been some studies into the benefits of certain medications, but the main point of herbal remedies is to avoid medication where possible. Will You Take Turmeric on a Daily Basis? There are various herbal remedies available to help ease various health problems. Turmeric is one that you likely have in your curries already, and you probably have the Turmeric in your cupboard. Did you ever think that it could help ease your ailments, prevent some diseases and even cure others? There are various benefits due to the curcumin in the spice. While the actual kitchen spice may not be the best, you can get stronger options and make them work well with fatty foods and black pepper. In most cases, it will help to reduce inflammation and offer antioxidants to the body to keep disease and pain to a minimum. Whether you suffer from IBS, arthritis or diabetes, you could find that it is beneficial. If you can’t stop taking prescription medication, it could be a useful addition to deal with the symptoms and side effects. Talk to your doctor if you do decide to use it for a current health problem. If you just want to improve your brain function or reduce the risk of inflammation, there’s nothing wrong with adding it to your diet today! From a simple kitchen ingredient to one of the healthiest spices there is, you should take advantage of the nutritional benefits of turmeric. It's handy and highly available so it shouldn't be so hard to add a pinch of it in your meals or use it accordingly as natural remedy. 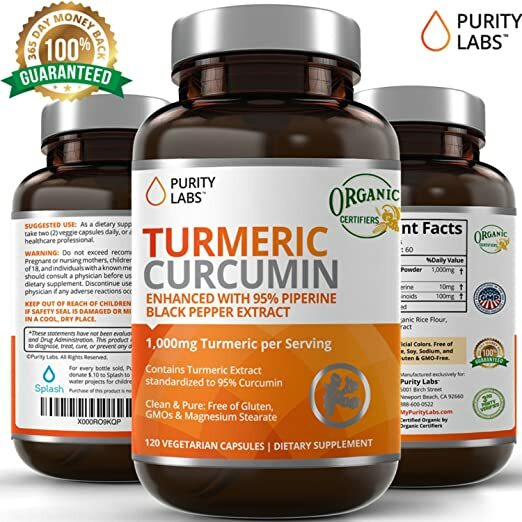 One of the best certified organic turmeric capsules are sourced from Certified Organic Turmeric root (curcuma longa) containing the compound, Curcumin and certified organic by Certified Organic Farmers. Based on our research PurityLabs Organic Turmeric Curcumin Supplement stands out from all other supplements in the market. This Non-GMO turmeric curcumin supplement is free of preservatives, soy, lactose, gluten, sugars, transfats, sodium, and magnesium stearate.